My name is Alex and the Youth in Action Programme rocked my world!! My story is one that takes us from the crumbling city streets of the West Midlands to the towering misty mountains of Svaneti, and back again into the murky, mystical Forest of Dean, home of the ASHA Centre. If Youth in Action rocked my world, then the ASHA Centre’s training course on outdoor education as a tool for non-formal education uplifted my soul. One of my first ever tastes of the Youth in Action Programme came about in the summer of 2012 when I was offered a once-in-a-life time opportunity to attend an outdoor training course in Svaneti, Georgia. 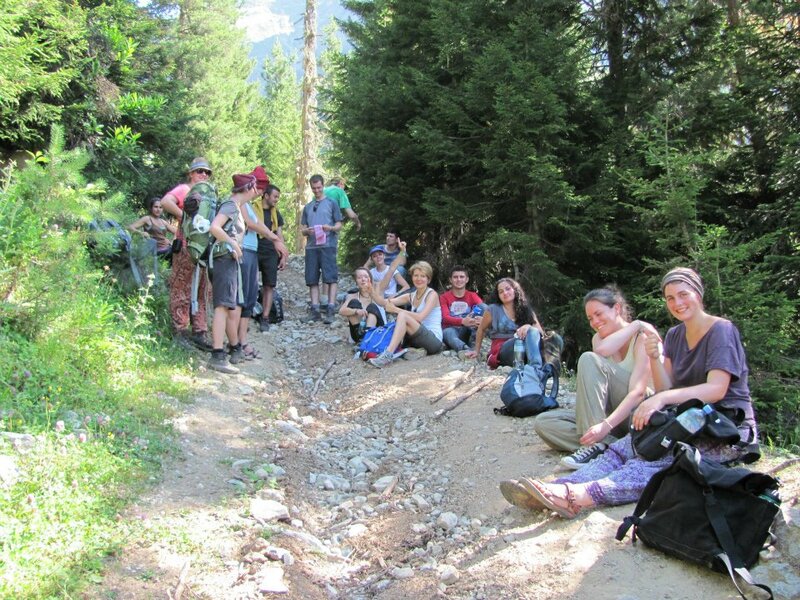 Svaneti is Europe’s largest uninhabited area and the aim of the project was to look at how outdoor education could be used to empower young people. On the surface it sounds so simple, but when we finally arrived after hours of travelling by Soviet-era trains, the diversity of culture and values of all the participants was a complete shock to my system! There were young people from Germany, Austria, UK, Armenia, Azerbaijan and Georgia and all of them were able to share completely different perspectives and points of view. It was crazy but what was even crazier was how much I felt myself learn. Having spent most of my life in formal higher education I was astonished at how much more real and in what depth I was able to understand and sympathize with other cultures, in a way that was simply not possible to know through books. The project lasted 7 days with all of us learning a great deal about empowering young people through non-formal education. A high point for me was sharing a tent with an Azerbaijani who would wake up at 5 in the morning to pray! What an amazing insight into a different culture and one which my tentmate was happy to share and discuss. After the project I was so inspired to follow up the project and continue to raise awareness of non-formal outdoor education that I begged the organizers (the ASHA Centre!) to create a follow up in the UK. The unbelievable successful, fun and inspiring result is outlined below. I was invited by the trainer of our training course in Georgia to participate in the ASHA Centre’s very own ‘outdoor experience’ training with participants from Estonia, UK, Romania, Ukraine, Georgia, Armenia and Belarus. However, having been present the previous year, our trainer (Sandy) empowered me into taking a more active role in the training. Along with the inspirational ASHA Centre volunteers, we all began to plan the different hikes we would do as well as the various different camping locations. For somebody like me who had grown up in an extremely working class family from Wolverhampton (central England), to be this involved in nature and the outdoors is a rare opportunity. Not only this, it also enabled me to receive a greater insight into the facilitation of youth empowerment with a close working relationship to the trainer. As for being a participant on the training course… WOW! We were meeting orphans from Ukraine who could barely speak English, and who became the greatest of friends, just through learning to make a fire. Never in my life have I seen a better example of how humanity can communicate without language. The entire week was a celebration of non-verbal communication and infinite possibilities of empowerment through outdoor education. We were also able to discuss how it was appropriate in the participants’ different countries – with special interest coming from the participants from Belarus. This is the story, though it is far from the end… After discussing about the rich and beautiful forests in Belarus, a few of us as participants agreed that we wanted to try and write a transnational youth initiative together, to highlight the importance of healthy lifestyles across three different cultures (the third being Georgian). Never in my life have I felt more empowered than I did then. It is quite amazing that I found my life calling outside of formal education. Such an emphasis is nowadays, on educating people for a competitive job market but sometimes we forget to do what we love. Here through the Youth in Action Programme and the ASHA Centre I found my life calling. No matter how challenging and difficult it may seem I want to give my life to empowering young people – especially those with fewer opportunities. In fact it is those people who are often overlooked at school that I saw inspired before my very eyes to create the most beautiful and striking land art. The creativity, freedom and inspiration that the Youth in Action Programme (now the Erasmus+ programme) can offer has touched many people and many of my friends. To its credit it has changed my life forever.